It’s about to get hot as balls in Hell’s Kitchen. As I was walking up 9th avenue last night, I noticed a new sign sticking out from the building on the corner of 53rd and 9th. What did this sign say? You guessed it: The Meatball Shop, complete with its signature meat grinder symbol. Unless you caught sight of the unlit sign 10 feet above the sidewalk, you’d never know what was going on inside the building. The windows are totally covered, considering the restaurant’s still under construction. I am SO excited to see this upcoming addition to the neighborhood! It’s true that Hell’s Kitchen is home to more independent joints than it is to restaurant chains, but I couldn’t be happier to find out that this NYC spot making it’s way over to 9th avenue. 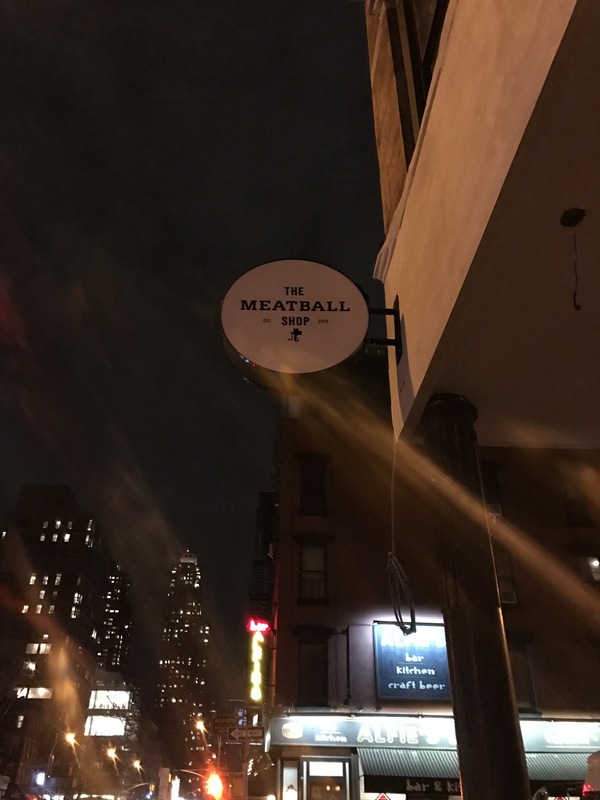 There are currently 6 Meatball Shops scattered throughout NYC in the following ‘hoods: Upper West Side (I’ve been here an obnoxious three times), Chelsea (been to this one too! ), West Village, Lower East Side and the Upper East Side. There’s also one in Williamsburg, BK! Regardless of where you live, there’s a Meatball Shop relatively accessible to you. There are no excuses for those who haven’t tried it! I adore this place. The restaurants are super trendy and even though they’re each a part of the chain, they have an aurora of chic exclusivity about them. Many, if not all of the restaurants appear to have outdoor seating as well. That’s a huge plus in my book. One of the best ways to experience NYC is to sit out on a sidewalk among locals while enjoying a good meal. ICYMI, TMS’ speciality lies in the realm of Italian eats, more specifically: the art of making meatballs. They offer 5 kinds of meatballs, including classic beef, spicy pork, chicken, veggie and a special for that day. While I’ve tried the chicken, my favorite balls are the spicy pork. Try pairing them with the parmesan cream sauce. It’s heavenly! While they have a variety of other sauces like classic tomato, mushroom gravy, spicy meat and pesto, the parmesan cheese is my favorite by far. I’m also very biased because I’m a cheese lover! There are a few different mix and match options to help you get your meatball fix. For instance, you can get the classic beef meatballs paired with tomato sauce over spaghetti (AKA old reliable, spaghetti and meatballs.) You can swap the spaghetti for another pasta, like rigatoni or you can ditch the carbs altogether and get braised greens, sauteed broccoli or a simple salad among other options. My recommendation is the Kitchen Sink! You get three balls and a sauce of your choice over a batch of greens and veggies picked by the chef. It’s fresh, tasty and is just as filling as eating pasta, but without the uncomfortable food coma. Plus, you’ll be saving calories, which means you can drink more wine, right? They serve meatball sandwiches, too! If you’re considering an appetizer, the Mini Buffalo Chicken Balls, are small yet scrumptious. Honestly, they’re the only app on the menu anyway, so for $6.50 why not go for it? All of the ingredients used at The Meatball Shop, including the meat, are locally sourced and all natural. This results in not only fresh taste, but a good way to give back to local businesses. I’m not going to lie: TMS is not the fanciest, five-star gourmet Italian joint in town. That being said, it truly has a local and trendy feel about it. I always tend to feel much cooler than I actually am whenever I eat there. It’s also a fantastic spot for small groups and large parties. I think The Meatball Shop will feel right at home among the Hell’s Kitchen foodies! It pains me that I don’t have pictures from TMS, but in the spirit of this “breaking news” situation, I decided to post this anyway! Please forgive me! Of course, when the restaurant opens I’ll get some pics for you all! You can check out their website in the meantime! Poor quality (thanks, iPhone) but PROOF.